Hi again. 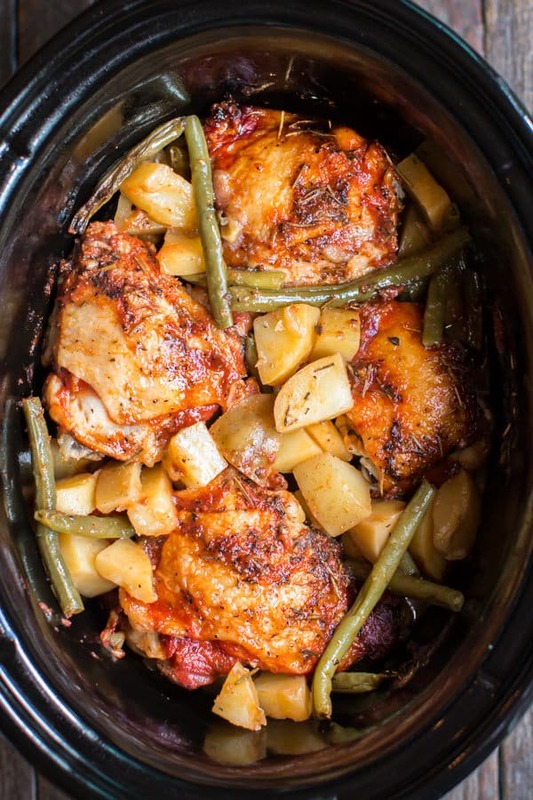 I love when I find a complete meal for the slow cooker. No worrying about making side dishes for this meal since everything is made at once. For this meal I used bone-in chicken thighs. I think if boneless skinless chicken is used in the recipe the entire recipe would be very dry. The juices from the bone-in, skin-on chicken thighs help make a flavorful sauce along with the tomato sauce and seasonings. 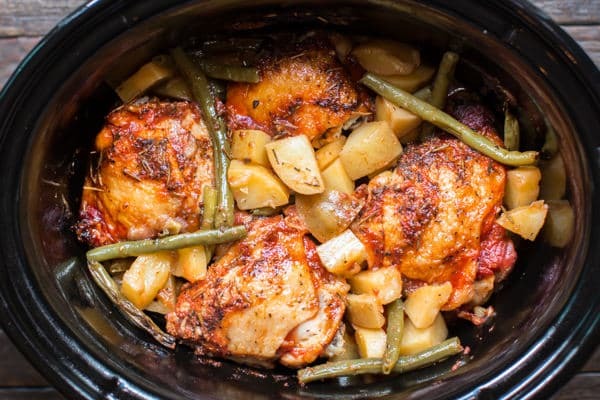 Here is my video about how to put together this Slow Cooker Full Chicken Dinner. You can follow me on YouTube, here. This is a great Sunday dinner meal, set this up after lunch and no worries about dinner at all, just scoop and serve when the timer goes off. I hope you are having a great week. I will have more recipes next week for you! Set a pan on the stove top and set to medium high heat. Add enough cooking oil to coat the bottom of the pan. When the oil is hot, brown the chicken on both sides, you don't need to cook the meat through. 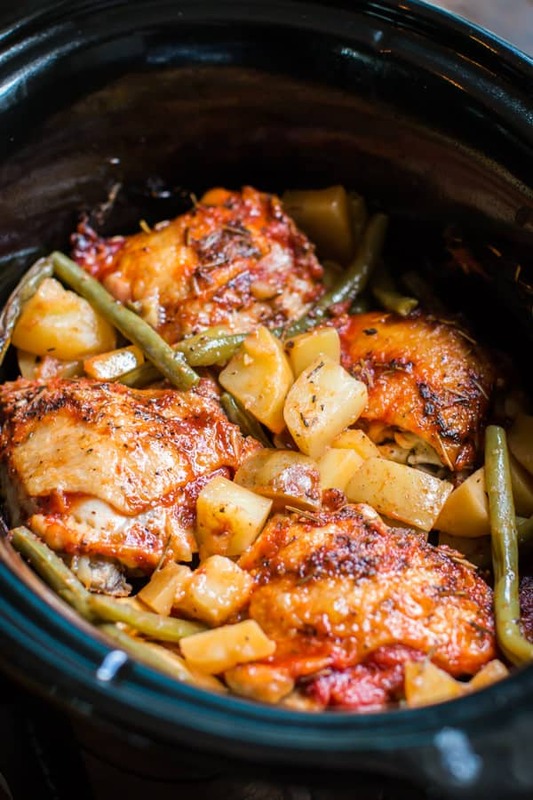 Add the diced potatoes and green beans to the bottom of the slow cooker, toss them together to combine them. Add the chicken thighs on top of the potatoes and green beans. Add the garlic. Drizzle over the tomato sauce, then sprinkle over the salt, pepper, thyme and rosemary. Take a spatula and smear around the sauce trying to combine the seasoning into the sauce. Cover and cook on HIGH for 4.5 hours. 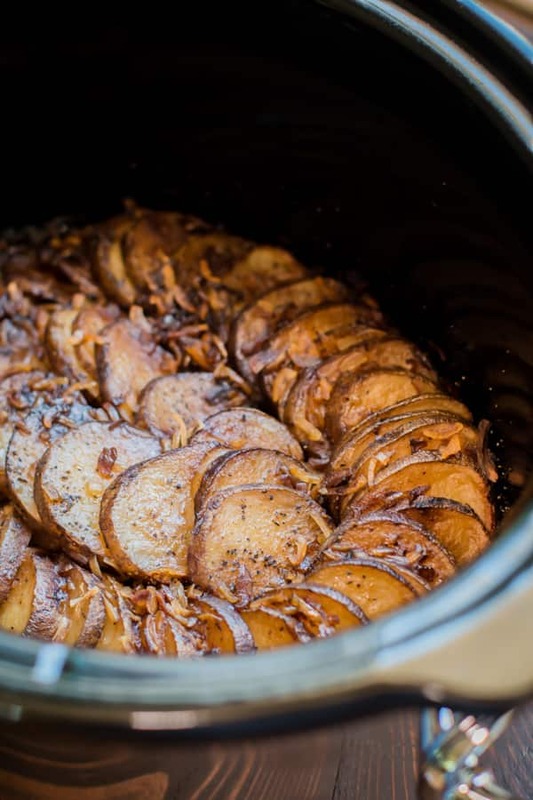 Do no open the lid during the cooking time or the potatoes will not get tender. I used my Touchscreen 6.5 quart Crock-Pot for this recipe. Any slow cooker 6-quarts or larger will do fine. Hi Sarah, This looks like an awesome meal. Right now I’m a bachelor so this will meal will be great when I get in from fishing, and it’s all in one pot. I’m unsure how that would turn out. You may need to add a touch more time and a touch more liquid. I don’t recommend skinless chicken for this recipe. We don’t eat thighs is why I was asking. Thanks. Just wondering why you don’t eat the thighs? The dark meat is the most nutritious and flavorful so it’s often preferred. The white meat has less fat but also less flavor and is drier. A lot of people don’t eat dark meat. I would imagine just double the time. I’m going to use 9 hours on low for mine since I’m working all day. Thank you I am gonna try this…. It may be fine on low for 8 hours. The chicken will be falling off the bone, but I think still tasty! Hello, just wondering how the chicken skin looks so brown. Is this a function of your special crockpot or will this turn out brown in any normal crockpot. Mine is pretty basic. Thanks for inspiring me to pull my slow cooker out I haven’t used it in ages as I have lacked the confidence. It takes so long it would upset me to wait all that time for it to not work out, think that’s what I am scared of. I cooked this for a late lunch today and ignored the advice regarding using skinless breast fillets and it worked out great. Chicken was super juicy and tender. Great recipe though, it’s on the list now! That’s great to hear Lee! I’m glad it worked out. My wife just bought 10# of chicken leg quarters. Can’t resist a sale. Do you think I can sub these for the thighs? I’d need to double this recipe for my large family does anyone know how much cook time I should add? Woudn’t it make more sense to mix the tomato sauce and the seasonings before adding it to the cooker? You can do that! I don’t because I didn’t want to dirty a bowl. Everything bubbles together in the slow cooker anyway. What could I use in place of the tomato sauce? I’m unsure, that’s what I based the recipe around. Are you not wanting tomatoes at all? That would make it a different recipe, but maybe try cream of mushroom soup. That is true but your suggestion also sounds good. Thanks. I think it will be fine, I don’t know how long though, sorry! Just made this. Cooling right now. Needs a little work. The tomato sauce dried on to the chicken thighs. I needed about a quarter cup water to get enough steam in the crockpot to cook the veggies. Added carrots and chopped onions. For some reason, the Thyme doesn’t go with this. Added Chili Powder and lots of Garlic Pepper. My crockpot runs hot. Should have checked this at 3-1/2 to 4 hrs. Potatoes a little over-cooked. Will try this again next time with some changes. More chicken! When you say tomato sauce do you meaan ketchup. Sorry bit confused? It’s tomato sauce in a can, find it near the canned diced tomatoes. Have you ever substituted something for the green neans? Could you use home canned green beans instead the same way without them getting mushy? I think they will be ok, I’ve done green beans in soup before for a long cooking time and they don’t get too mushy. I made this, I didn’t peel my potatoes, instead of pouring the tomato sauce on the chicken and then adding the spices and then trying to mix them up on top of the chicken I mixed the tomato sauce, garlic and spices together and then poured it over the chicken, I also added a bit of paprika for more color, it was awesome and will make it again. Made this three times. This was very popular with my family. So much that I doubled the recipe for Christmas and served with white rice. Imagine setting a Christmas meal and it coming out subpurb hours later with little to no work. The in-laws loves it too. Comes out great each time. Thank you. I would do high for 5-6 or low for 8. 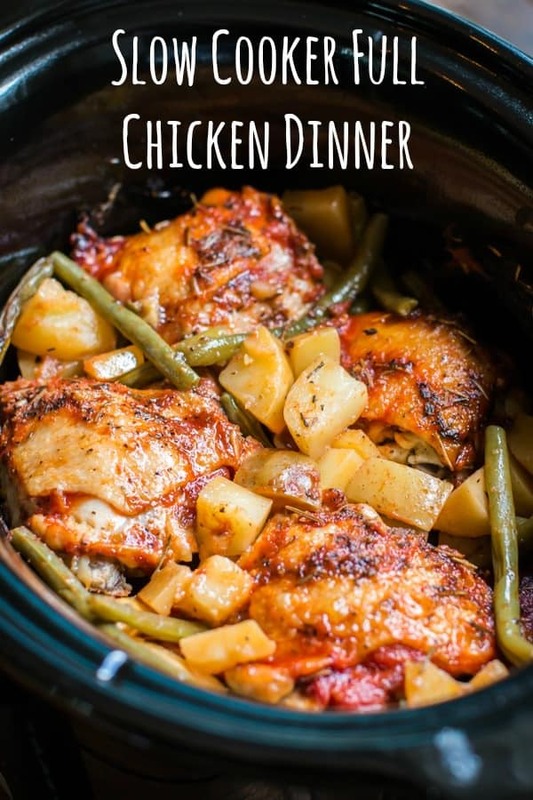 Just made this today…I used 6 boneless, skinless thighs and it was delicious!! I added carrots to the potatoes and green beans for extra flavor. Definitely a keeper! I have a 2.5 quart slow cooker. I should be able to cut the recipe in half. Should I cut back on the amount of time? I was a little skeptical of this recipe, thinking I wouldn’t care for the tomatoes with the beans and potatoes. I didn’t need to worry; boy, was this delicious! I seasoned each layer with S&P. The only other variation I made was that I didn’t have regular tomato sauce and so I used 12 oz of roasted tomato pasta sauce to cover 6 chicken thighs. The veggies came out so savory. Chicken is hubby’s least favorite meat, so I’m so happy to find a recipe that’s fairly inexpensive and easy that goes over so well with him. We both loved it! Yum! Hello I have a 4 at crock pot can I still make this recepie? I think it should fit. Had it for supper tonight. It went over really well. Just needed some more salt. But everybody adds to taste. Will keep recipe for sure. Hi Sue, I do tend not to over salt things. I’m glad you enjoyed it! Can you use drumsticks? That’s all I had.=/….what would the cooking time be?. Hello Sarah I wanted to say Thx for sharing this recipe it looks delicious. What I wanted to ask you was can I use more than 4 pieces of chicken in a slower cooker at once? I’m feeding 8 adults and I don’t think 4 pieces of chicken will work ☺ any advice you can give will be helpful. Have a blessed day. You could Add a few more and double the sauce or use drumsticks instead? This looks wonderful!! Wondering if you have any experience or advice about making this recipe in a pressure cooker?